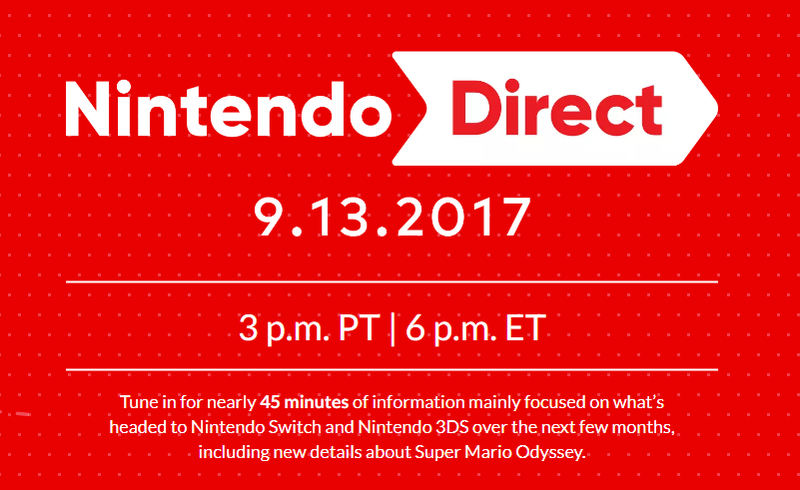 On Wednesday, September 13th, 2017 at 3PM PT, Nintendo will be having a Nintendo Direct presentation. This is the first general presentation since their E3 Nintendo Spotlight in June. The Direct will focus on upcoming games in the next few months as well as an in-depth look at Super Mario Odyssey, which is set to be released on October 27th, 2017. This is the first general Direct outside of E3 not focusing on a specific entirely since April, 2017, where it was announced that a Holiday Kirby 3DS title was going to be released, but hasn’t received any details since. This Direct will be 45 minutes long, which is over 15 minutes longer than the E3 Spotlight which announced games such as Yoshi Switch (working title), Kirby Switch (working title), and the long-awaited Metroid Prime 4. This Wednesday’s Nintendo Direct will be available on their official website.